The campaign group, Human Rights Watch, has accused the Sri Lankan army of "slaughter" and rebels of "brutality" towards civilians in the north-east. It called on the government to end its "indiscriminate artillery attacks" on civilians and its policy of "detaining displaced persons in internment camps". Human Rights Watch also condemned the Tamil Tigers for "increased brutality" towards trapped civilians. The government and rebels both strongly deny targeting civilians. Top UN humanitarian official John Holmes is currently in Sri Lanka and is visiting camps of displaced civilians in the north-east. Human Rights Watch said that it had compiled a 45-page report based on a two-week fact-finding mission to northern Sri Lanka in February. It said "independent monitors" had told it that some 2,000 civilians had been killed and another 5,000 wounded in the past month. James Ross, legal and policy director at Human Rights Watch, said: "This 'war' against civilians must stop. Sri Lankan forces are shelling hospitals and so-called safe zones and slaughtering the civilians there." Mr Ross said civilians who escaped were held "in squalid military-controlled camps" and the government seemed "to be trying its best to keep its role in their ordeal away from public scrutiny". The government has not commented directly on the report but says it is doing all it can to avoid civilian casualties and accuses the rebels of using civilians as human shields. Human Rights Watch also urged the Tamil Tigers to permit trapped civilians to leave the war zone and to "stop shooting at those who try to flee". Mr Ross said: "With each battlefield defeat, the Tamil Tigers appear to be treating Tamil civilians with increased brutality." Both the Sri Lankan government and the UN have also accused the rebels of shooting civilians. Tamil Tiger political chief B Nadesan dismissed the accusations as "malicious propaganda". "There are 300,000 people who want to stay with us because they are confident that we are their guardians," he said. Independent journalists cannot travel to the war zone so claims on either side cannot be verified. Mr Holmes is currently on a three-day visit. On Thursday he urged Sri Lanka's army and the Tamil Tigers to do everything possible to avoid civilian casualties. "I hope to hear no more of shootings of people trying to leave or recruitment of children as soldiers," he said. The Sri Lankan defence ministry quoted Mr Holmes as saying the UN would help Sri Lanka to enable the return of normal life and normal democratic politics. Mr Nadesan told the BBC Sinhala service on Thursday the rebels were prepared to adhere to a ceasefire immediately if the international community could create a "congenial environment". The government has regularly dismissed any ceasefire and has vowed to crush the rebels. 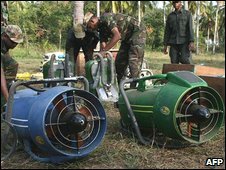 Separately, the army said it had found diving equipment and underwater "scooters" used by rebel suicide bombers. The equipment was found after fighting at the village of Ampalavanpokkanai on Thursday. About 50,000 soldiers are pressing the Tamil Tigers into a patch of north-eastern jungle after taking the key areas of Kilinochchi, Elephant Pass and Mullaitivu. The Tigers have been fighting for a separate homeland in the north and east for a quarter of a century.